Have you ever thrown a tapas party? A group of tastemakers from the Sunday Supper Movement and I will be sharing a fantastic variety of tapas foods, including desserts and beverages with all of you. 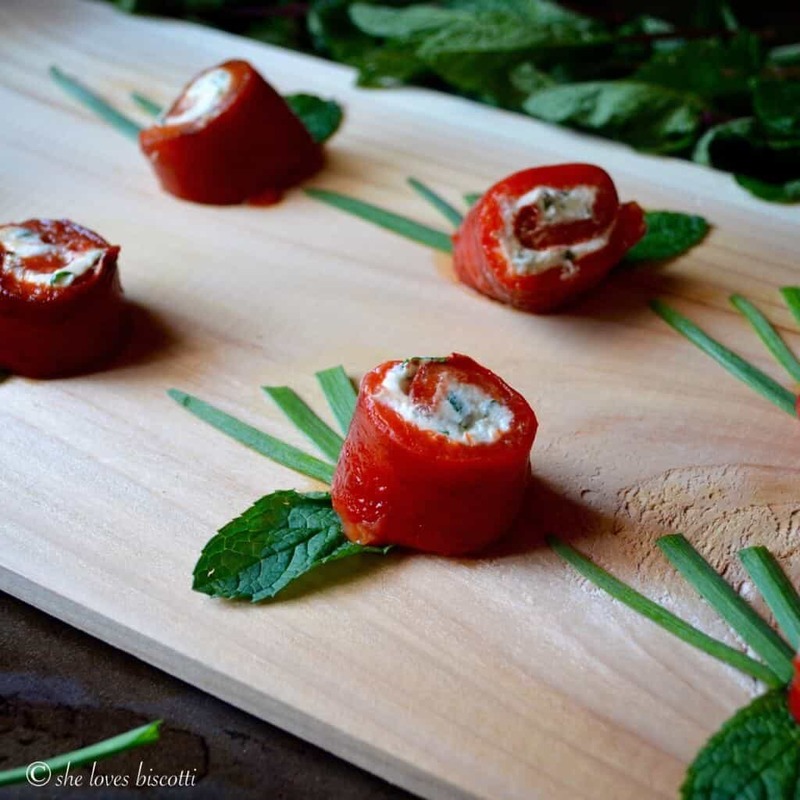 Since this week’s theme was tapas, I thought of sharing this recipe for these Roasted Bell Pepper Goat Cheese Bites with all of you. As you probably know, tapas is the Spanish term for appetizers, or small snacks. I don’t know about you, but I love the concept of having small bite-sized portions of food, especially when entertaining. As a guideline, if you are hosting a 1-2 hour cocktail tapas party, you should plan to serve 6-8 bites per person; whereas a tapas dinner party will require 12-15 bites per person. Although the appetizers can be served warm or cold, I have a preference for cold. These Roasted Bell Pepper Goat Cheese Bites are truly the ultimate finger foods. Just like my Smoked Salmon Pinwheels and Lina’s Baked Eggplant Caponata these little gems can be prepared ahead of time, giving the host and hostess much more time to focus on family and friends. I got the inspiration for this recipe for Roasted Bell Pepper Goat Cheese Bites from my 2008 Martha Stewart Living Magazine. The original recipe calls for scallions, but I like to use chives instead, since I always have so much of this wonderful herb in my garden. Martha’s recipe also calls for Piquillo peppers. I like to replace these with roasted bell peppers, mostly because of convenience. (At the end of summer, we like to take advantage of nature’s bounty by roasting red bell peppers. As a result, I always have some hanging around in my freezer. 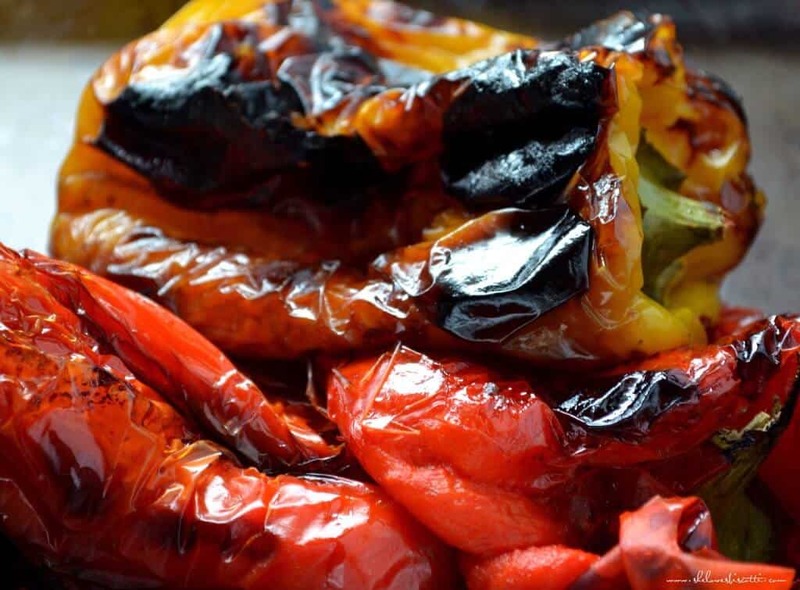 If you are not sure how to roast bell peppers, you can refer to this recipe for Marinated Roasted Bell Peppers.) If you wish, you can use Piquillo peppers. 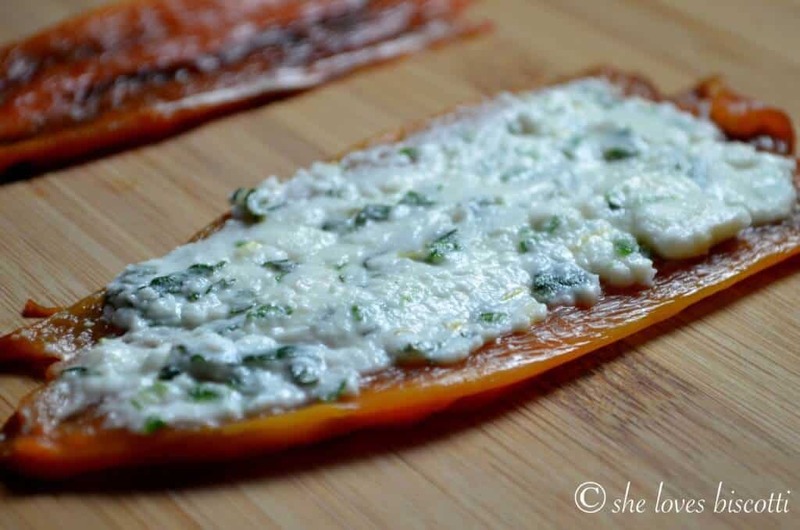 There are a number of reasons why I love this recipe for Roasted Bell Pepper Goat Cheese Bites. For starters, it’s simple. The creamy goat cheese spread takes almost no time to put together, and nothing can be easier than roasting a bell pepper. The bites can be made a couple of hours before your guests arrive, so they are super convenient. And the number one reason I love these bites is, well, they are really, really good. This recipe for these Roasted Bell Pepper Goat Cheese Bites provides such an explosion of flavor, it is almost impossible to stop at just one. The only thing left to do is to uncork that bottle of wine and enjoy a relaxing evening with friends, while savoring some tasty tapas. Have fun planning that tapas party! This recipe for these Roasted Bell Pepper Goat Cheese Bites provides such an explosion of flavor, it is almost impossible to stop at just one. Chives and mint leaves for garnish. In a small bowl, combine the goat cheese, chives, mint, lemon juice, red pepper flakes, salt and pepper. Separate each roasted red bell pepper in 4 segments. Place about 1 teaspoon of the cheese mixture on each segment. Refrigerate the rolled up pepper quarters for up to a few hours before ready to serve. Cut each rolled up pepper quarter in half and plate. 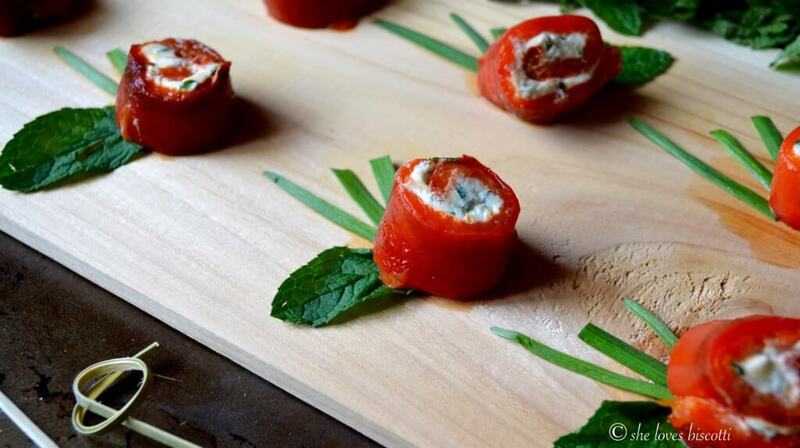 Garnish with chives and mint leaves. Every Sunday, there is a wonderful group of bloggers called the #SundaySupper tastemakers that collaborate together on a theme. As was mentioned, today’s theme was Spanish Tapas and I think you’ll agree the line-up of recipes is totally amazing! I would like to thank the event host for this event Caroline of Caroline’s Cooking . Thanks Caroline! Remember to join the Sunday Supper live chat at 7pm ET tonite as we talk tapas and share small plates LIVE from Tapa Toro Orlando. If ever visiting the beautiful region of Orlando be sure to visit Tapa Toro Orlando restaurant. These look delicious! Could you use jarred roasted red peppers? And do you think they would hold on a toothpick? Hi E! Yes, I think the jarred variety would work just fine. The difficulty I had with a toothpick is that it would keep sliding off… I think the next time I make these I might add a basil leaf or something on the inside so the toothpick sticks. Great questions! Thanks so much for stopping by, appreciate it! I love anything made with roasted red peppers. I love the combination with goat cheese. Thanks for sharing. I love these- the addition of mint is a surprise too! Love roasted peppers! These little bites look delicious! These look great, I’m sure they are perfect for nibbling on with a few drinks! These are so cute! Love the bright color too!